[vc_row][vc_column][vc_column_text]One of my favorite things about Mexico’s wine region is how innovative it is. While researching a place to stay, I found so many interesting lodging options, there wasn’t enough time to even begin to try them all. 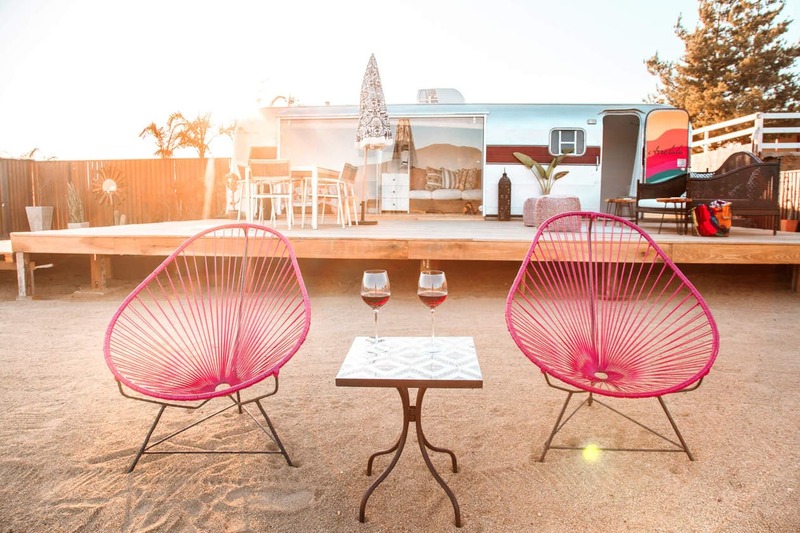 From eco-lofts to a renovated airstream, glamping tents and a bubble hotel where you can watch the stars from your bed, keep reading to discover 4 unique Valle de Guadalupe hotels and vacation rentals to check out in Baja California. 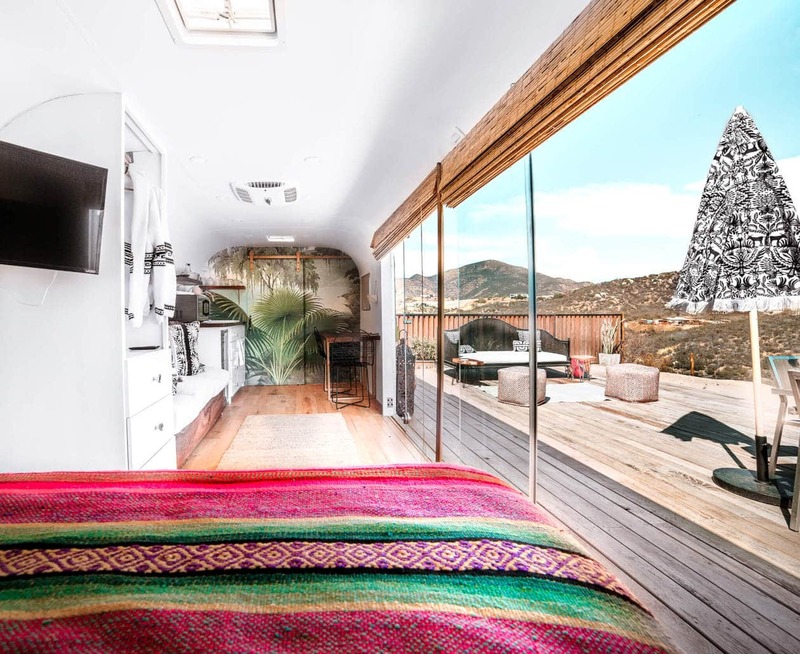 Arre Lulu Baja is a brand new renovated 30′ Silver Streak Trailer, and it’s my top pick for unique Valle de Guadalupe hotels in Baja. Charisse and Tony designed the space and they did an impeccable job making sure that every detail is perfect (not to mention Instagrammable!). On the property you’ll find a barbecue grill, Wifi, multiple lounging areas, ice chests and a beautiful panoramic view of the valley. Arre Lulu Baja captures the vibes of this area so perfectly that you’ll never want to leave. Arre Lulu Baja does their bookings on Airbnb. For booking and information click here. 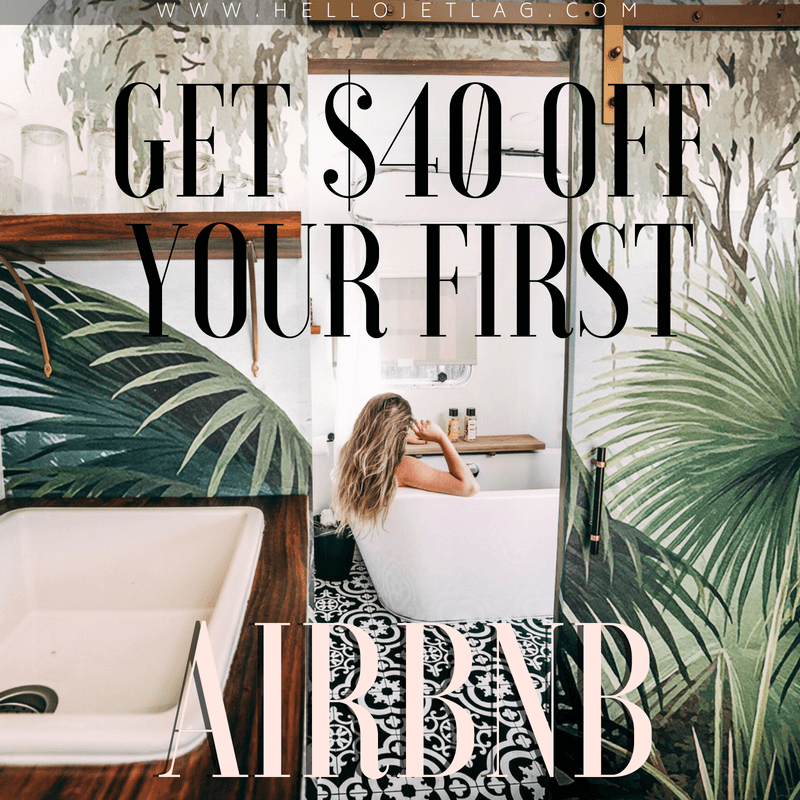 If you’ve never used Airbnb before, click below for $40 off your first stay! Special Conditions: There is a 2 person maximum and Arre Lulu Baja does not allow smoking on the property. As you drive down La Ruta Del Vino, you might notice a cluster of little cabins on the hillside. 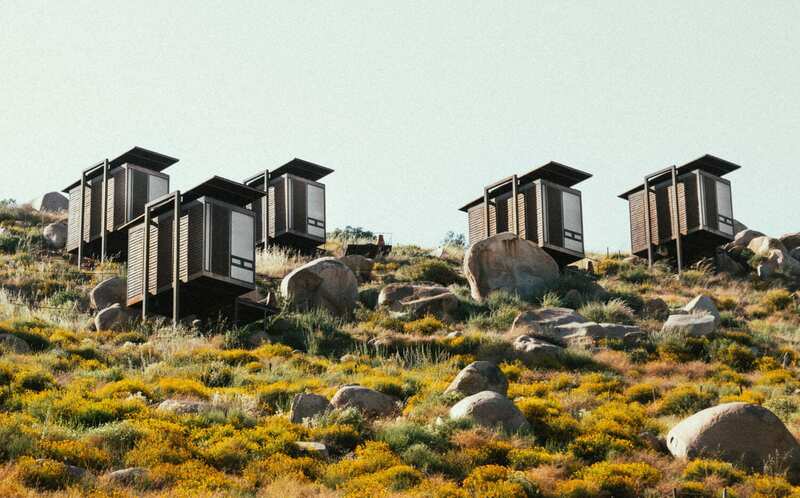 That’s Encuentro Guadalupe, a modern eco-lodge hotel. 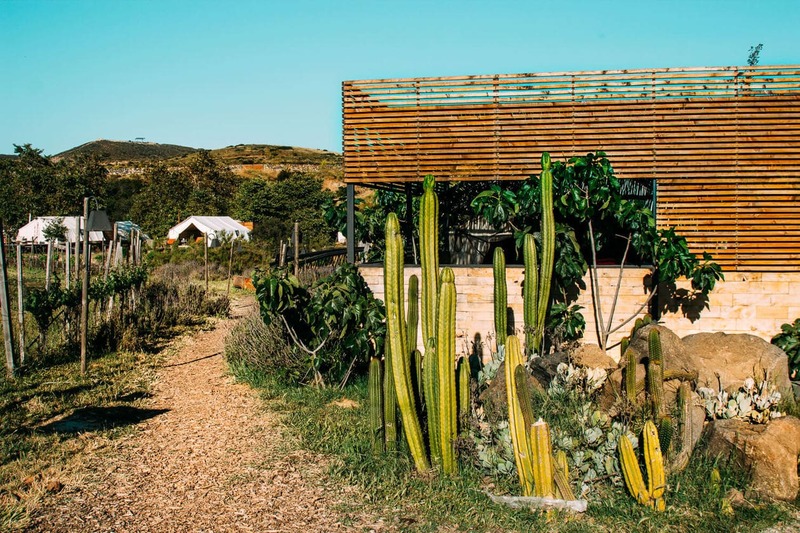 Encuentro Guadalupe’s eco-lofts were designed to suspend off the hillside, as not to disrupt the natural landscape. The lofts are minimalistic but modern and they each have a private terrace to for enjoying the view. Encuentro Guadalupe offers a private guest-only pool and bar near the lofts, and down the hill they have a full restaurant and winery. 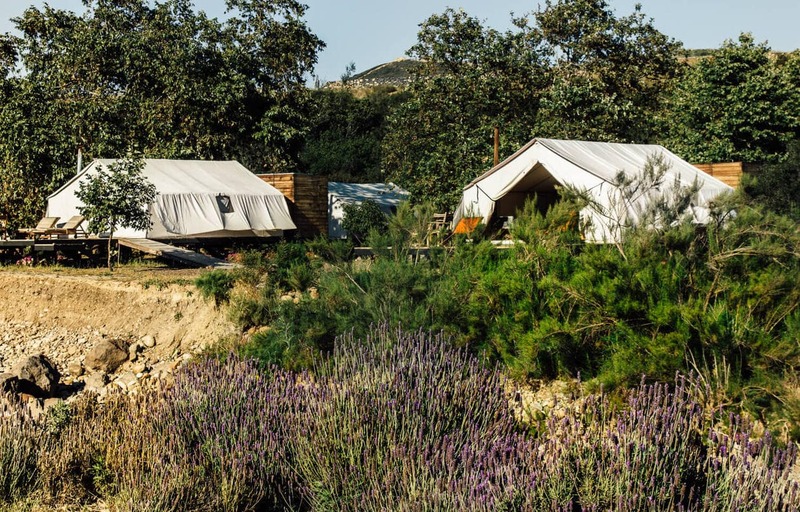 Located between the vineyards and the Pacific Ocean, Cuatro Cuatros is a 144 acre environment where guests can go to relax and return to nature. 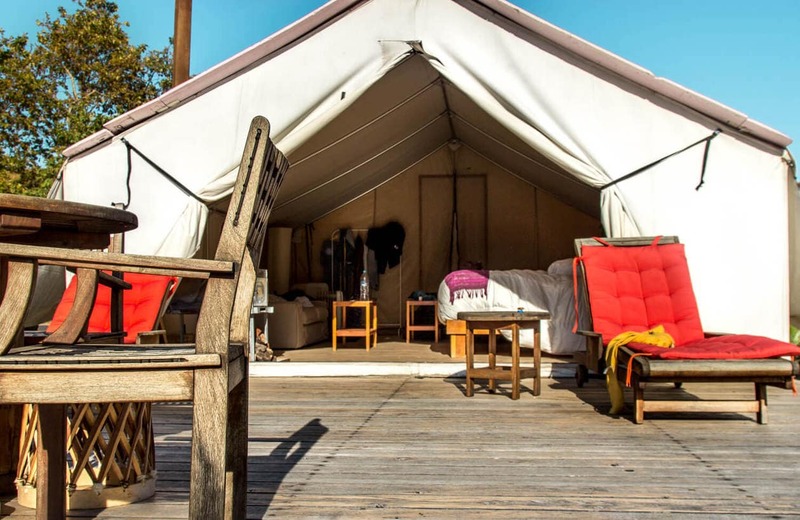 On the property, there are 14 luxury glamping tents each with their own mini terrace out front. This is the type of camping I can get down with, equipped with air-conditioning, a mini-bar and a real bed 🙂 . While at Cuatro Cuatros you can hike, mountain bike, go horseback riding and even zip line. They have a restaurant on site, as well as one of my favorite sunset bars at the top of the hill, with the best views of the coastline. While Cuatro Cuatros is slightly further than the other Valle de Guadalupe hotels, it is only a 25 minute drive to the wineries. They also make their own wine, so you can do a tasting here as well. The only downside is if you’re visiting on a weekend, they have a two night minimum. For more information plus bookings click here. 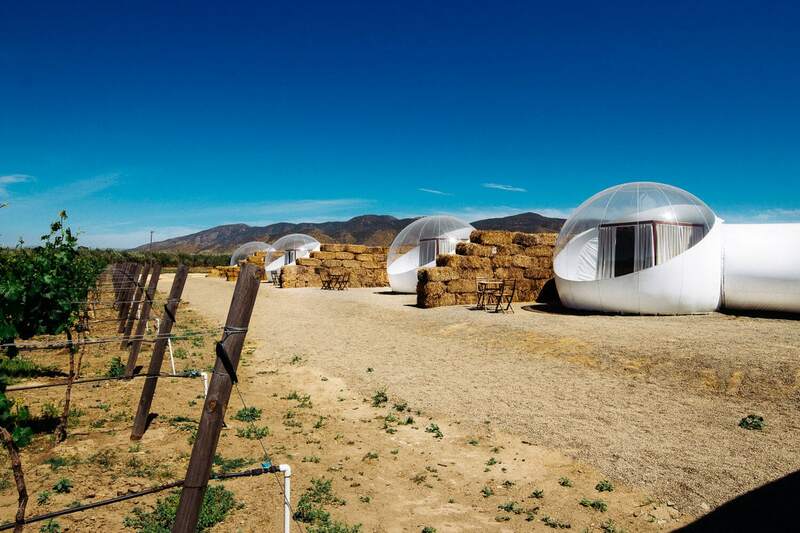 One of my favorite designs of all the Valle de Guadalupe hotels, Campera Hotel Burbuja is a centrally located bubble hotel tucked away in the middle of the vineyards. The bubbles were designed in France with the highest grade materials and there are 10 of them on the property. 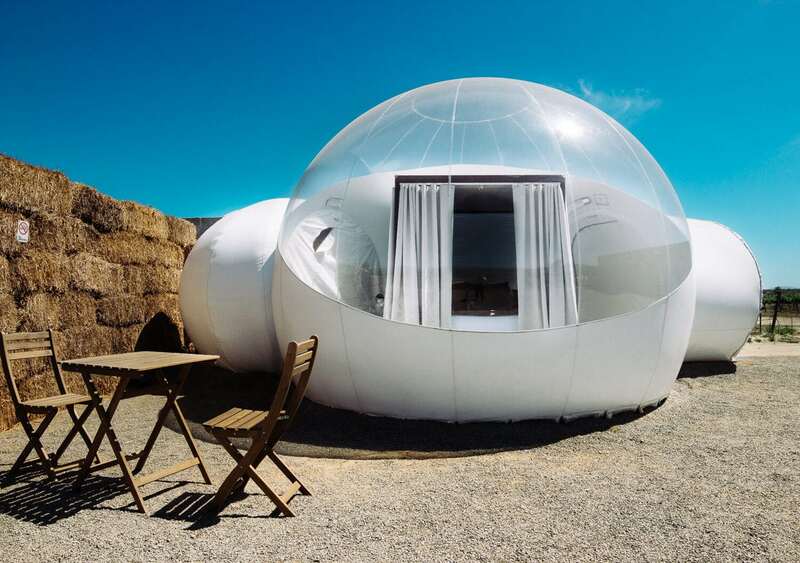 Each bubble has a bathroom, full-sized bed and luxurious amenities. They are also equipped with air-conditioning and heat, but currently do not have wifi. Am I missing anything? 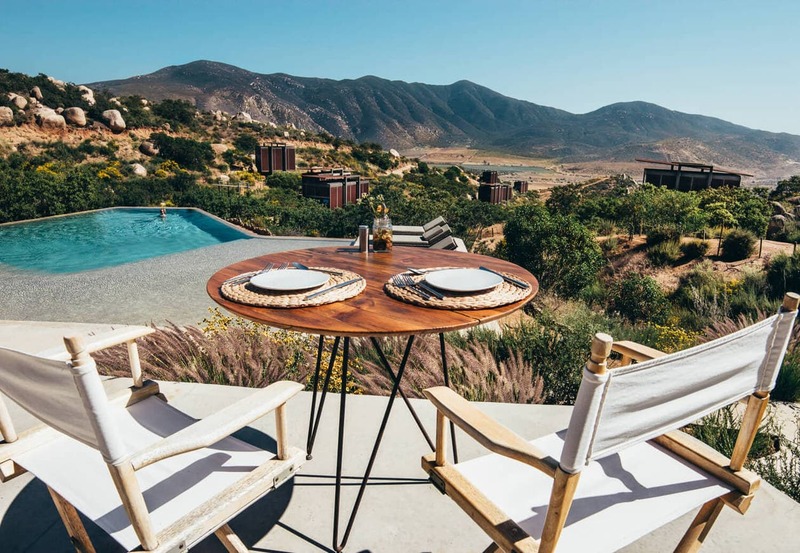 What are your favorite Valle de Guadalupe Hotels? Disclaimer: This is not a sponsored post. Some links may be affiliate which means I receive a small commission (at no cost to you) if you purchase something. All proceeds go toward helping me run this site. Thank you for your support! I love off-beat accommodations! These all look great. My husband went on a motorcycle trip in that area earlier this year, and it left us both wanting to go back with a little more time to explore. Same! I only spent a weekend, but it was one of my favorite new places I’ve visited this year. I can’t wait to go back.